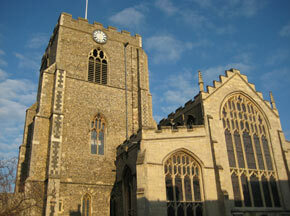 The church of the Assumption of the Blessed Virgin Mary is one of the largest parish churches in England. It is the second church to stand on the site at the southwest corner of the Abbey precinct. The ‘…church of the Blessed Mary with its tower…’ was built by the sacrists Ralph and Hervey in the time of Abbot Anselm (1120-1148), and dedicated by Bishop John of Rochester (1137-1142). However, there is nothing visible in the present structure that survives from the Norman church. The chancel was rebuilt in the Decorated period (c.1290 – c.1350), and the tower rebuilt or remodelled c.1393-c.1403, as shown by local wills. Other features that remain from the Decorated period are the re-used north doorway and windows in the Notyngham Porch. The modified Norman church consisted of a nave, with a tower at the northwest corner, nave, aisles and a chancel. 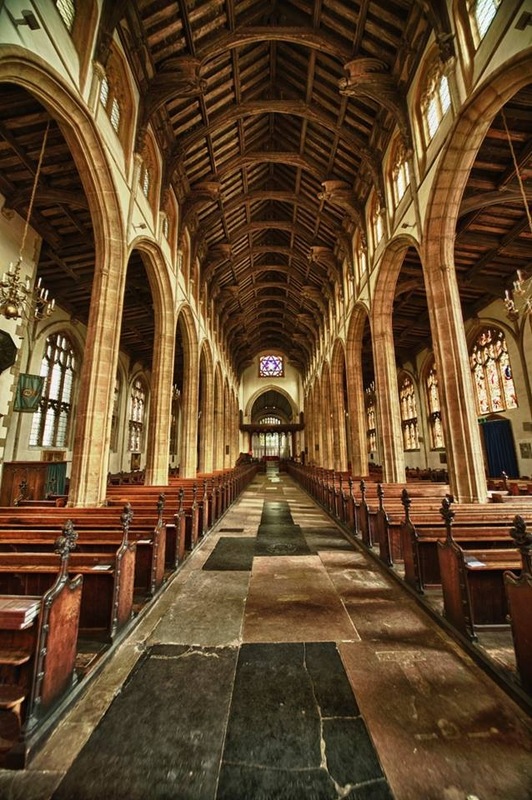 The nave and its aisles were shorter and narrower than the present ones. The two western piers of the nave arcade mark the original west wall, in line with the tower and the precinct wall. The north wall of the aisle probably abutted onto the south-east corner of the tower. The nave and aisles were widened and lengthened c.1424-c.1433, with the result that the tower now projected into the north side. The architect may have been William Layer (d.1444) a local mason, who had worked on the rebuilding of the west tower of the Abbey. The progress of the rebuilding and furnishing can be traced in local wills. In 1424 and 1425 several sums of money ranging from £10 to £20, were left to the “fabric” or “structure” of the new church of St. Mary. In 1425 a bequest was made to the paving of the church. While St. Mary’s was “in the course of reconstruction” the congregation worshipped beneath the western tower of the Abbey. It is recorded that in January 1431 they so narrowly escaped disaster when the tower collapsed. Further bequests of £1 and 6s 8d were made to the new church in 1431 and 1433. In 1432 Thomas Brakenhom, clerk of risby, requested “..to be buried within the walls of the new church”. This may just mean to be buried inside the church, or possibly indicates that the structure had not been roofed over. New “stools” or pews were mentioned in a bequest of 1434, and a new “roodloft crucifix” in 1436. John Notyngham in 1438 left £20 for a west and a south porch, although neither was built, and the money was subsequently used to build one on the north side. Bequests from 1442 to 1445 leave money for the new battlements of the church. The Decorated chancel was retained, and subsequently encased, in the 1460s and 1470s by side chapels and a sanctuary. Jankyn Smyth, a merchant and benefactor of Bury, had built the north chapel by 1463, the south by 1473 and the sanctuary by 1479, the completion of which gives the building as seen today. The interior, however, has changed several times. 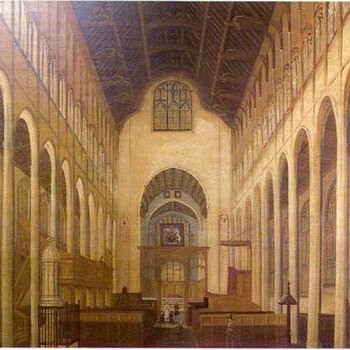 This painting depicts the interior circa 1710, and shows a gallery in the north aisle and box pews in the nave. 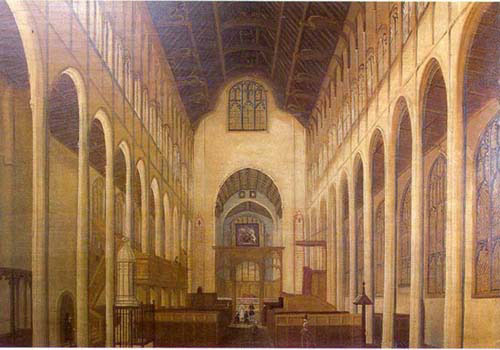 Later alterations included galleries in the south aisle and at the west end. In the Victorian era there were a series of ‘restorations’, which included replacing the box pews with the present bench pews, and firstly altering, then removing the galleries. Likewise, the pulpit and the font also endured various changes of thinking. 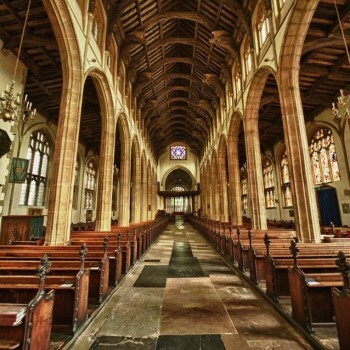 However, by the end of the 19th century the nave and aisles were more or less as they are today. Perhaps the most significant Victorian addition was the stained glass windows. These are considered to be of great merit and worthy of separate study. 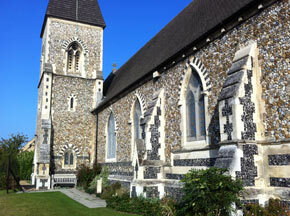 Further work was carried out in the early 20th century in the chancel and sanctuary.